The Luither star helped his musical pal unveil two tracks - Step Into The Shadows and Pull The Trigger - from his second album at The Box hotspot in London. They were so inspired by the crowd's energy and enjoyed the vibe so much that they decided to play Pull The Trigger a second time to the packed venue. Mr Hudson, whose real name is Benjamin Hudson, was joined by celebrity friends Kiefer Sutherland, photographer Rankin and model Olivia Inge as he gave a sneak preview of his new album, also called Step Into The Shadows. 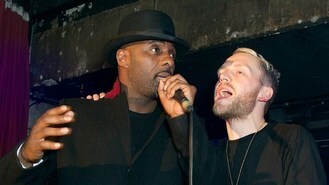 The 34-year-old, who has collaborated with Kanye West and Jay Z, also sang with rapper Giggs at the intimate show, which was supported by Smirnoff.